‘And Hannah prayed, and said, My heart rejoices in the Lord, my horn is exalted in the Lord: my mouth is enlarged over my enemies; because I rejoice in your salvation.’ – 1 Sam 1:2. The Hebrew name Hannah means ‘he has favoured me’ or ‘God’s given gift to the world’. The name Hannah translated into Greek, is Anna or Anne (the name of Mary’s mother). Both Hannah and Anna were women filled with the despair and bitterness of being barren. They both desperately desired to become mothers. Both said lengthy prayers to Yahweh for the gift of motherhood. Echoing in the prayer songs of Hannah and Anna is the loss of the Mother God. Echoing in both these women’s pleas is the pain of the absence of a divine mother who can understand the barren landscape of an unfertilised garden and the staleness of unchanging seasons. Both Hannah and Anna were blessed with becoming pregnant in their old age. Hannah’s Song resounds with the cadence of Mary’s Magnificat. There is a tradition of women prophets and visionaries which unfolds through their songs in the Biblical stories. In the discussion of the card of Miriam VII of Vessels, I quoted Phyllis Trible’s work on comparing the words of the Magnificat and the Sea of the Song. In this shrine we see an image of Hannah, surrounded by the fecundity and abundance of the Great Mother. While Hannah was without child, she had no appetite for life. She spent hours in prayer and beseeching Yahweh to gift her with a child. Mothering is the divine nature of life and providing for all her children alike is the divine purpose of the Great Mother. Here is Hannah in the image of the Great Mother Goddess, laden with the fertility and fecundity of nature. She carries an armful of wheat, a basket of fruit and at her feet sits the water bucket. Next to Hannah is the goose, an ancient symbol of the Great Mother. Mother Goose was seen as the great goddess of abundance and fertility. Today we know Mother Goose as the teller of fairy tales, but as we have already seen, that is an auspicious role in myth making. We also know that the goddess and her images had to go underground and hiding her in the figure of Mother Goose was a clever way of hiding her traditions in plain sight in a time of persecution and suppression. Mother Goose is referred to as Frau Gode in German stories. Goose translates as ‘gans’ in German; so the question is where does the name Frau Gode fit in? A direct translation would be ‘Mrs God’. We also know the fairy tale of the goose that lays the golden egg. The egg has always carried the meaning of life and rebirth in ancient traditions. It also symbolizes new life and transformation. The shape of the egg also has connotations as it is similar to the vesica piscis. (See in King of Distaff.) Goose is a partial anagram of goddess and Mother Goose hides the word Mother Goddess. The mother aspect of the goddess is still present today in Mother Mary. Mother Goose is seen as the magical author of all the fairy tales, reminiscent of our understanding of the Shekinah or Sophia. The old Germanic goddess Holde has always been connected to Mother Goose. There are many similarities between, for instance, both flew through the air on birds, or in wagons or sleighs pulled by birds. After the fall of Rome, Holda merged with the goddess Aphrodite, riding on the back of a goose through the sky. 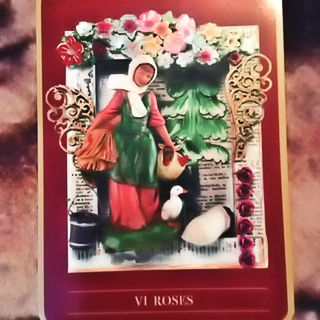 This card speaks about abundance and generosity. You are reminded of the fertile nature of Life and her ability to take care of all your needs. You may be at the receiving end of someone else’s generosity or you may be the generous one. Either way, this card follows on the dark days of illness and loss of the previous card and you are assured that a change in fortune and heart is taking place.